Who Will Win the Ivy League? Tens of thousands of people will travel to New Haven this Saturday to Harvard will take on Yale this weekend in what is the 132th rendition of The Game. Last year, the stakes of the rivalry game were clear: a Crimson win would cap an undefeated season and capture sole possession of the Ivy League championship, while a loss would mean that both the Bulldogs and Harvard would earn a share of the title. This year, the stakes are a bit different. Harvard, Penn, and Dartmouth all have only one conference loss on the year entering their final game, making the championship picture rather murky entering Saturday. All teams are heavy favorites to win their final game of the season (Dartmouth takes on Princeton, while Penn takes on Cornell). But in rivalry games, especially ones that can determine the outcome of a season, anything is possible. There are seven ways that the championship can be split heading into Saturday: a three way split, individual champions, and the three pairs between the three squads. Assuming that the games are independent, one can ascertain the probability of each of the seven outcomes happening once Saturday night rolls around. While there are no explicit win probabilities for each of the three relevant Ancient Eight games, there are spreads available online for each of the three games, per Sport Bet. These spreads can be converted into win probabilities, as designated by Betting Talk. Using the above method, each team has the following win probabilities entering their last contests. Penn has a near 100% chance of winning, but I rounded down to 99%, as no team has a probability of winning a game that comes super close to approaching 100%. Using the win probabilities above, one can use basic probability tenets to find the probability of each of the seven outcomes happening, using either the probability of a team winning or its complement to signal a loss. This method leads to the following distribution of final results atop the leaderboard of the Ivy League. 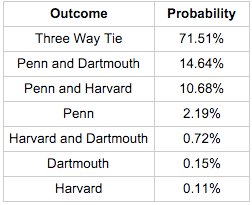 Harvard only has a .1% chance to repeat as sole champions of the Ivy League, while Penn has the highest chance of taking the crown for itself. There’s a 97.55% chance that the title is split somehow amongst the three teams, whether all the teams or only two get a share. While no one knows who will lay claim to the Ivy League title on Saturday, we do know one thing: It won’t be Yale. Is Tom Izzo The God of March or Has MSU Just Been Underseeded?